Fandom In Stitches: Last Day to Donate! This is it! 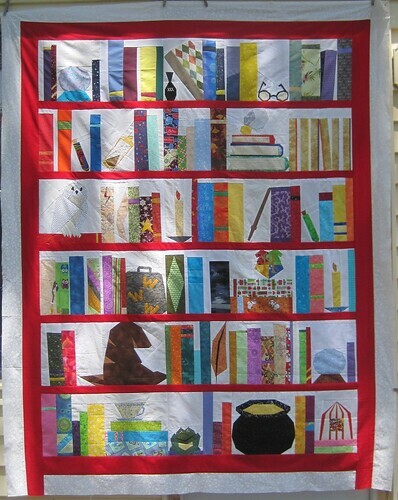 The LAST DAY to for your chance to win our very special Harry Potter quilt! Haven't donated yet? Don't despair, there is still time to get your name in the hat to win this Project of Doom quilt made by Fandom In Stitches readers! This very special quilt is being quilted by Shannon Shaw, the award winning quilter of the original Project of Doom made by Jennifer Ofenstein! See the original with awards here. How do you win? Just make a donation to The Linus Connection and forward your receipt to ofenjen@fandominstitches.com. You will receive one entry for every dollar spent. Donations accepted until 8 am Tuesday, June 18. Winner to be announced Tuesday, June 18 via video announcement! Our goal? $500 in donations! Current donations: $598...can we make it to $1000 before June 18? The Linus Connection is a Central Texas 501(c)(3) organization whose mission is to make and deliver handmade security blankets for children in crisis situations in Austin, Texas and the surrounding area. The blankets go to children in hospital emergency rooms, in crisis centers, in foster care, battered women's shelters, to any child who is in need of a little extra security in their lives. Please note that the winner will receive a finished quilt. Only the quilt top is shown. The winner will receive the finished quilt no later than July 31, 2013...Harry's birthday! Designed and pieced by Jennifer Ofenstein. Disclaimer: This event is being organized by Fandom In Stitches owner Jennifer Ofenstein to support The Linus Connection. The Linus Connection is not associated with Fandom In Stitches, but it is the favorite charity of Jennifer, who has been a active volunteer for the non-profit for over ten years.